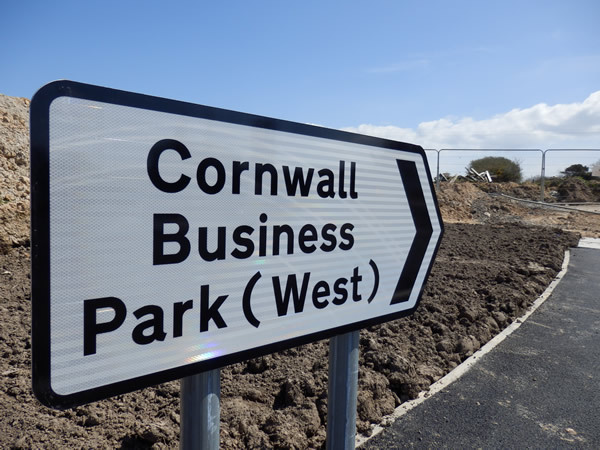 The Cornwall Business Park Phase 1 Project will facilitate small to medium enterprise (SME) growth by addressing market failure for the provision of high quality employment premises for SMEs in Mid- and West Cornwall. The project will develop 14 excellent quality employment units targeted for SME businesses, creating 3,482sqm of employment space. Each individual unit with have a flexible workshop/manufacturing/storage facility with roller shutter door access, plus a separate but linked, office facility, on two floors, which is accessible, with fully compliant facilities, including disabled toilets, parking and recycling facilities. Each unit will have solar electric and with energy saving specifications to assist operational economic and environmental sustainability. The site location is on a 27 acre site at Scorrier adjacent to the main A30 and just east of Redruth providing good access to this main artery and both access to markets and employees from Redruth, Camborne, Truro, Newquay and Hayle. The units vary from 236 to 329 sqm and may be combined to meet market demand. Marketing will be targeted for SME use, with flexible leasehold terms being made available to suit business needs. In addition the directors of the applicant company JAD have direct experience of such small employment unit management both in Cornwall and throughout the UK. In Cornwall sites under existing management include Indian Queens Trading Estate and at Victoria Business Park. Russell Dodge, Managing Director of Business Location Services Ltd with Mark Duddridge, Chair of the Cornwall and Isles of Scilly Local Enterprise Partnership and Sam Lockyer, Area Manager of Classic Builders, with members of his team.